During his long career, Jack Vance wrote several novels set in a single fictional universe known generically as Gaean Reach but only occasionally the author provided precise space and time references. The consequence is that the various series and individual novels set in the Gaean Reach are completely autonomous. The Cadwal Chronicles are set on a planet discovered by a member of the Naturalist Society of Earth, which established precise rules to preserve its nature. “Araminta Station” begins with a brief explanation of these rules and how a bureaucracy that grew over the centuries allowed to partially circumvent the original limits of human presence on Cadwal. These information explain how social classes are formed on the planet and how young people’s destiny is decided, important because the actual story begins with the protagonist of the novel Glawen Clattuc finding his place in that society. The planet, with its geographical features, and the society formed by human beings but also by the Yips, who were imported as laborers, are developed in “Araminta Station” because without vivid descriptions of exotic landscapes and local cultures it wouldn’t be a Jack Vance’s novel. Part of the story takes place on other planets but Cadwal remains central so there are continuous details on it, on the animals and on the plants that live there. In the case of humans and Yips, there are precise rules that lay the foundations of the story and its development includes not only the description of laws and customs but there’s also a lot of intrigue. What could be a paradise is the site of heinous crimes and other mysterious events that may initially seem unrelated but unexpected links are discovered in plots that span several years. “Station Araminta” is very long by Jack Vance’s standards but the author really knew how to fill the pages with great imagination. In this case, the extraordinary setting of the planet Cadwal is at the center of a complex story in which there’s an alternation of intense action and investigations with many dialogues where the pace slows down and the reader’s interest is kept by the progressive discoveries connected to the ongoing machinations with a number of twists. A consequence of this type of story is that character development is based in many cases on the discovery of some of their secrets by the protagonist Glawen Clattuc. Very few are what they appear and often what emerges in the course of the novel is not the whole truth about them. 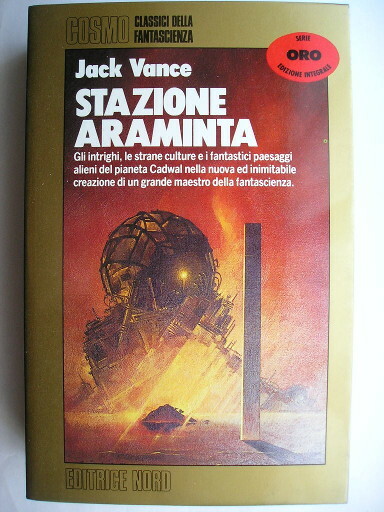 “Araminta Station” is the masterpiece of Jack Vance’s mature period in which the author shows his best in building up the various elements of the novel. The main plots have their own conclusion but in the final part a new one is started which will be developed in the second novel of the Cadwal Chronicles. Even as a stand-alone novel I think it’s a must-have for science fiction fans.